As the second weekend of Electric Forest 2018 comes to an end, we’re reflecting back on all of the magical and unforgettable moments the festival curated for its attendees during weekend one. A complete four day event full of whimsical encounters, wandering and exploring the forest, and non-stop dancing to some pretty eclectic live tunes, Electric Forest was everything we hoped for and more. Unlike any other music festival, Electric Forest brought about a sense of enlightenment as the days went by, and allowed attendees to truly find themselves and discover new paths along the many remarkable amenities the forest has to offer. Everything within the forest’s grounds fused together so effortlessly, and created the most striking event experience. Right beside the campgrounds and on our way into the festival gates we encountered Main Street, an area consisting of exquisite fashion and food vendors with some pretty intriguing hangout spots dispersed throughout including ‘The Brainery’. Throughout the day, several discussion panels and informative teachings were presented here, including meditation and breathing techniques, discussions about feminism within the music and entertainment industry, and several mental health and wellness panels as well. Wandering through Main Street opened up our minds and allowed us to devour some unique tastes from across the globe and meet some extraordinary entrepreneurs before heading into the festival. What a way to start off the day! From the moment we crossed the festival gates on Day 1, we could just feel the enchantment that lingered profoundly in the atmosphere. The first stop along the journey deep into the forest was the Tripolee stage, a completely open-air installment with plenty of outdoor space for attendees to dance the day and night away. The openness at Tripolee is so massive that the area also featured Hanna Muse’s Yoga series every day at noon, where attendees could relax and unwind an set the ground for the what the rest of their day would look like. Yoga at a music festival? Thats Electric Forest for you. The most memorable sets of the weekend in this alfresco setting included Green Velvet and friends blasting fire back to back techno beats throughout his La La Land curated event series on Thursday, Jauz’s 2 AM bass-infused closing set on Friday night, and MALAA’s malicious and filthy house sounds closing off the stage entirely for weekend one. Not to mention, Insomniac creator Pasquale Rotella even brought out his daughter Rainbow on stage during Fisher’s uplifting tech-house set on Saturday as the sun was setting, and even she was feeling the incredible energy in the air. The next stop along our forest expedition was the Ranch Arena, full of greenery and subtle hills for us to gather and listen to some of the most prominent names in the music world. Galantis absolutely destroyed the arena on Thursday night with their unique set, in which we accidentally stumbled upon and chose to stay entirely for. On Friday night, Griz and his extraordinary live band brought all the funk that the forest called for and was easily one of the best live sets of the entire weekend. ZHU and Bassnectar – two of the most highly praised names in electronic music – set our expectations at an all time high on Saturday night as well. Before both sets, fans made sure to claim their territory at the arena hours beforehand in order to witness these musical masterminds bring their music to life in the most extravagant way possible, and their performances were nothing short of breathtaking. An extraordinary set from RÜFÜS DU SOL on Sunday night brought about all the feels, and had us reminiscing on the enchanting feeling the forest curated for us as we danced the final night away under the moonlight. After catching an impressive set at Ranch Arena, we then ventured into the festival’s central grounds where the magic of the forest truly comes to life. Between the midst of the frolic decor and undeniably scenic trees and surrounding nature, this is where we began to encounter the true colors of the forest. As a middle ground for the forest’s layout, the Reincarnation Village coexisted. Meant for wandering around and discovering inspiring creations, the Reincarnation Village featured positive quotes dispersed throughout and common notions of several spiritual beliefs. A neighboring wedding chapel carried out various thrilling weddings throughout the days as well, as lovers could recite their vows and cherish this special moment within the magic of the forest. Beside the village also lied the Grand Antique, full of fluorescent and mesmerizing lights and hammocks for attendees to truly indulge in the forest’s vibes and watch the fascinating creatures of the forest walk by. Not to mention the Trading Post, where you can trade one good for another like back in the bartering days before the value of currency even existed. After all, the forest is all about giving and receiving. Right beside the Trading Post a secret stage with several secret sets throughout the weekend prevailed as well, in which we accidentally stumbled upon like many other fascinating features of the forest. Within this same captivating essential area we found ourselves lingering into The Observatory and the Forest Stage, where we were able to truly immerse ourselves through the intriguing musical sounds of various artists including Kasbo, Mr. Carmack, Mija, Shallou, and Medasin to name a few. The Forest Stage sure does it’s name justice, as it is literally a stage in the middle of the forest’s many trees, completely hidden from the rest of the festival grounds. Even deeper within the forest is Sherwood Court, the last and final open-air stage with more of that “main stage” feel to it. Surrounded by pristine greenery and a marvelous view of the iridescent Michigan sky above the trees, we had the opportunity to dance the first day’s sunset away to GRYFFIN and witness a rare live set from Keys N Krates. Throughout the rest of the weekend we indulged in the purest live sounds from Bonobo, The Glitch Mob, Chromeo, G Jones, and Louis the Child among many others. As if these areas were not already magnificent enough, the last and final portion of the forests’s grounds consisted of the Jubilee tent stage similar to that of the many trance and techno stages at other grand festivals. The most visited sets were Space Jesus throwing down straight dubs on Thursday night and Hayden James hitting us with those house feels on Sunday night. Talk about diversity! Right next door, The Hangar circus tent felt like a theme park all on its own and had attractions within such as tattoo parlors, coffee and candy shops, and a hidden secret stage all the way at the end which resembled a grand ballroom-style venue. Inevitably, it is easy to get lost in the forest, as it has so much to offer and so many hidden paths to come across. Every day we found ourselves discovering something new and intriguing, and that is precisely what Electric Forest is all about. At the forest, everyone has a different story to tell, yet we are all considered one. 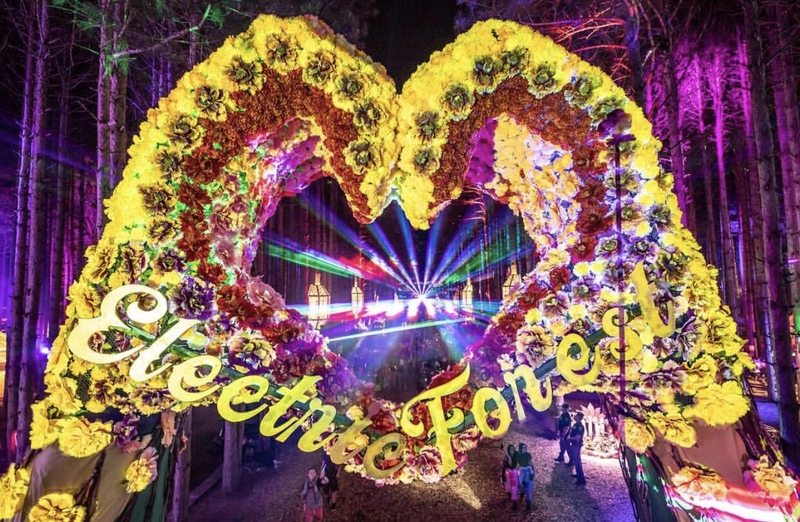 Electric Forest is incomparable to any other music festival out there, as it’s remarkable and one-of-a-kind qualities make it the most magical place to exist. Thank you Electric Forest, for effortlessly merging four days full of exceptional music and lifelong wondrous memories. We’re already counting down the days until next year’s journey!